The presented Turkish bagel is inspired by the famous Turkish Simit, the heavily sesame encrusted ring of dough, omnipresent in every corner of Turkish streets. To those who have traveled to Turkey, same as the author, the most iconic memory may very well be the street Simit vendors who carry the extraordinarily over-stacked trays of Simit on their heads. 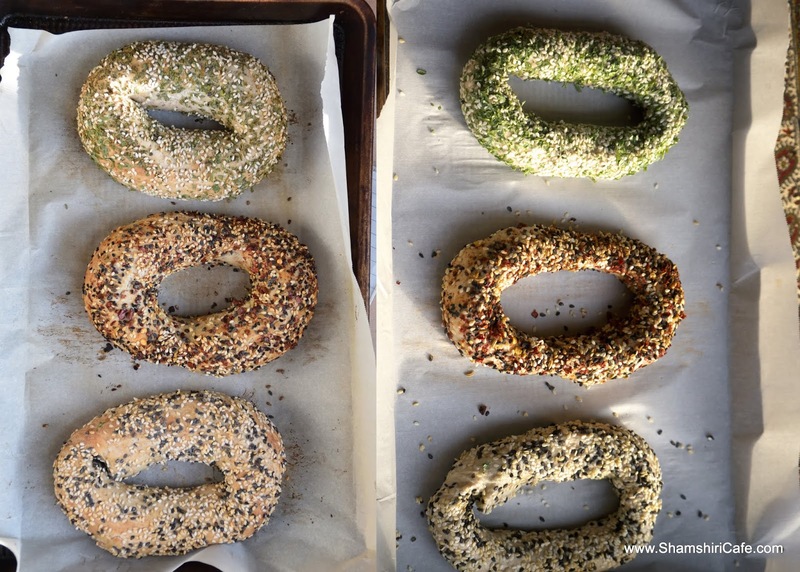 Simit and its variations are popular across the Middle East and Eastern Europe. 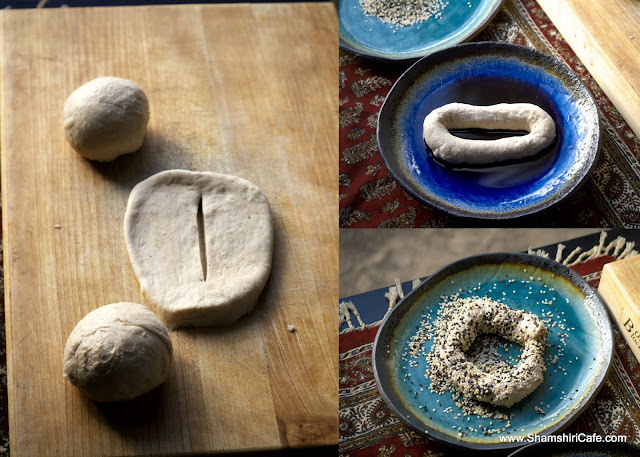 The following recipe features a variety that is a cross between Simit and Jursalem bagel. 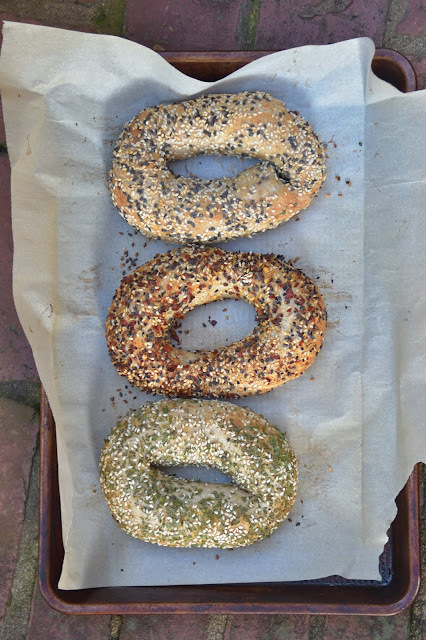 Unlike the traditional bagel, the formed dough is not boiled; like many Middle Eastern bread styles two leavening agents, yeast and baking powder namely, are used in its preparation. * The recipe needs overnight proof. The night before the baking day, sift the two types of flour and baking powder. In a separate bowl mix the cold milk, yeast, salt, and sugar. Add the dry mixture to the wet and form a dough. Although the dough is slightly wet, the hand-kneading is still possible. Knead until the surface of the dough is smooth and until you can successfully perform the gluten windowpane test. Let the dough rest in room temperature for half an hour. Transfer the dough to a sealed vessel and let ferment in the fridge for 8 and preferably up to 24 hours. 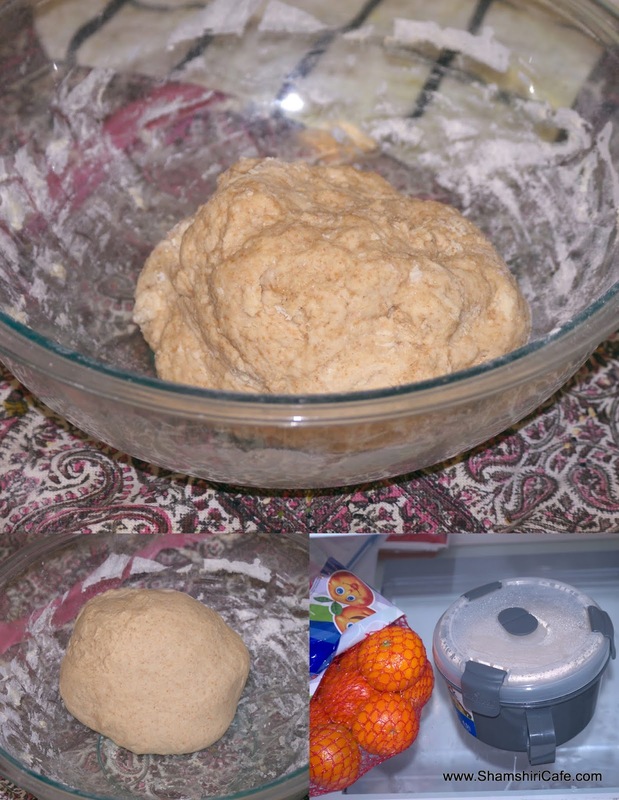 Remove the dough from the fridge an hour before the operation, put in a warm place, and let proof until double in size. 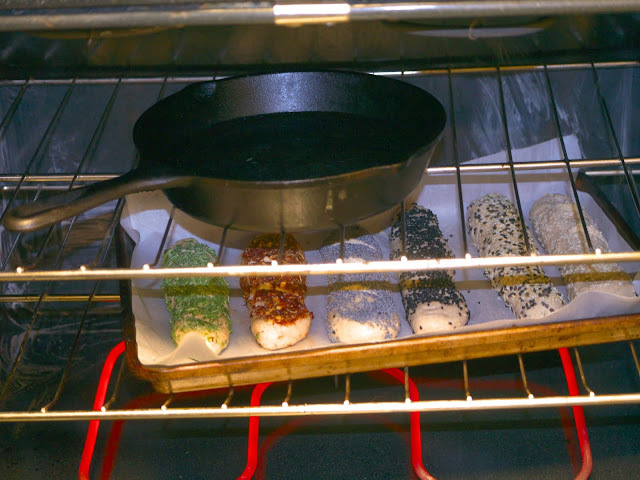 Roll the dough into a snake-shaped pipe and cut into six equal pieces. Roll out each piece of the dough with a rolling pin. With a sharp knife, cut a slit in the center of the spread dough. Pass your four fingers through the opening and stretch the dough outwards. Form an oval ring of 15 cm long and 10 cm wide. 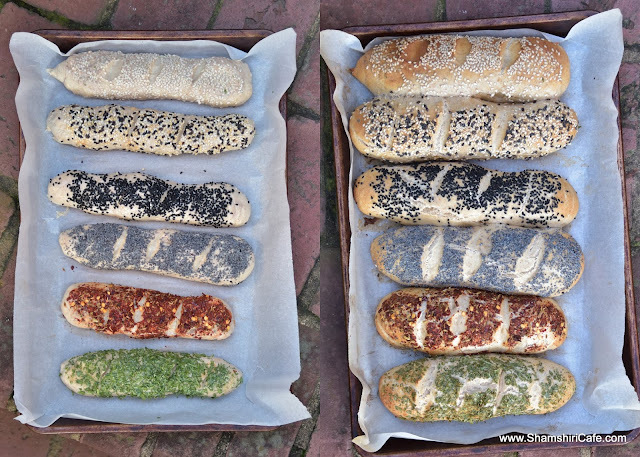 Roll the dough between your hand palms, making sure its thickness is uniform. Dip the ring into pomegranate juice (or the diluted molasses) first and then in the seed mixture. The ring should be generously coated with sesame, no spot on its surface should be left blank. Arrange the rings on a thick tray (or double thin trays). Cook in a preheated 400F (~205C) for 15 to 20 minutes or until golden brown. It is crucially important to generate some steam while baking the bagels. The steam endows the bagels with a crunchy outside. To do so, put a cast iron on a higher level rack. As soon as the dough tray is transferred into the oven, pour some water on the cast iron and immediately shut the door. 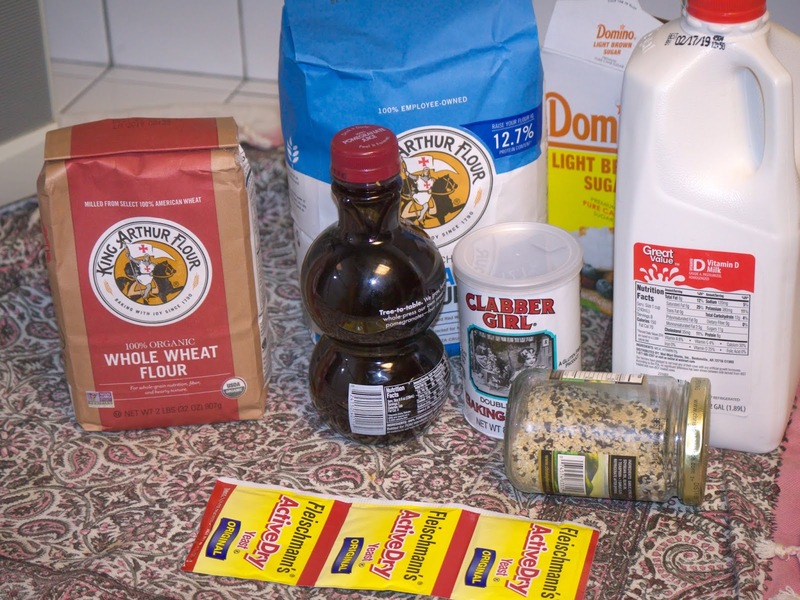 Sandwich bread can also be made with this dough. For this application, the dough should be rolled like sandwich bread, dipped in pomegranate and seeds, and scored with a sharp razor. Cook in the same situation as that of the above bagels.